This IBM® Redpaper™ publication provides a brief overview of OpenStack and IBM Cloud Manager with OpenStack. It focuses on the use of OpenStack with the IBM XIV® Storage System Gen3. The illustration scenario in the paper uses the OpenStack Icehouse release, which is installed on RedHat Linux servers, and the IBM Storage Driver for OpenStack. This paper is intended for clients and cloud administrators who look forward to integrating IBM XIV Storage Systems in OpenStack and using IBM Cloud Manager with OpenStack environments. 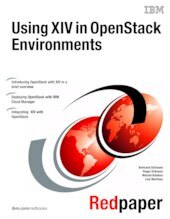 The paper provides guidance in setting up an environment by using XIV as the back-end storage in an OpenStack cloud environment. This paper is not an official support document.